Banana Shake is a Donkey Kong minigame found in Mario Party 6. Delfino Plaza from Super Mario Sunshine can be seen in the background, meaning the minigame is set on Isle Delfino. 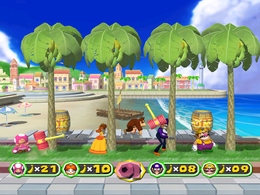 Players have to shake the banana tree to gain bananas or banana bunches within the time limit. If a hammer pops out and falls from the tree, players have to dodge them so they can continue shaking the banana tree. If a player gets hit by a hammer, the player is stunned at the moment meaning the player can't shake the banana tree at all. In one of the pages in the Miracle Book, Peach and Luigi are playing the minigame. Peach gets the bananas while Luigi gets stunned by the hammers. Rules – "Shake the banana tree to make as many bananas fall as you can! Press to avoid falling hammers." Advice – "Don't mistakenly dodge bananas by pressing !" This page was last edited on January 19, 2018, at 14:01.